Excited for 12 days of cookies?! I am! Most of the recipes I L O V E for Christmas are found in Season’s Eatings holiday ebook & menu planner — on SALE this month for $9.99! I also have three new Advanced Plan creations for you: Peppermint Bark, “Candy Cane” Macaroons and…my most superlative dessert yet…Grasshopper Pie! Today we’re talking bark. Peppermint bark is a Christmas classic. Who can resist it? Most commonly you’ll see it sold in department stores and served at parties constructed of milk chocolate, white chocolate, and bits of minty candy canes. What does that translate into? Disease-causing sugar, food dyes, and more toxic sugar. Well I’ve cleaned it up, per request of my friends Nicole and Mark, just in time for Christmas! This delicious and super easy peppermint bark makes a wonderful treat or holiday gift. 3.) 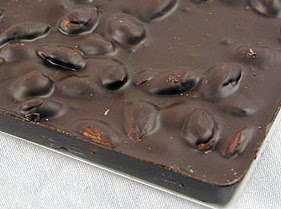 Once melted, pour onto natural waxed paper and use a spatula to spread chocolate about 1/4 inch thick. (Optional: Sprinkle with crushed raw nuts, sea salt, dried fruits.) Allow to cool and dry 6 hours or overnight. 4.) Once dry, break chocolate apart into uneven chunks, store in airtight container until ready to serve.